Liriodendron tulipifera is a large tree. 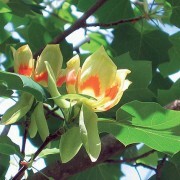 It is noted mainly for its unusual shaped leaves and the orange tulip-like flowers that arrive on the tree in early summer. The Tulip tree also has outstanding bright gold autumn colour. 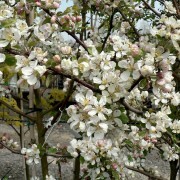 Malus floribunda is a rounded, deciduous tree with dark green leaves. It has crimson buds which open white or pale pink in late spring, which are followed by very small yellow fruits. Malus ‘Golden Hornet’ has white flowers followed by a large crop of bright yellow crab apples which hold into the winter. 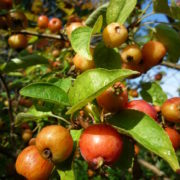 Malus x moerlandsii ‘Profusion’ is a small-medium size deciduous, spreading Crab apple with coppery young foliage, which turns bronze-green in the autumn. 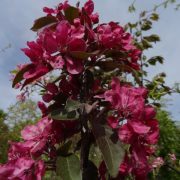 Malus x moerlandsii ‘Profusion’ has dark purple-pink flowers in late spring. These are followed by reddish-purple fruits in autumn. It tolerates pollution well, and is therefore suitable for rural and urban gardens. 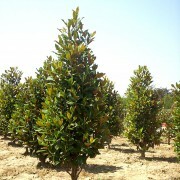 Magnolia grandiflora is an evergreen which makes a magnificent tree and is often used as a shrub. Glossy, leathery green leaves above a reddish-brown underside. It produces fragrant large creamy white globular flowers. 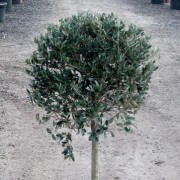 As a tree it is ideal for screening. Nyssa sylvatica is a medium slow growing tree with dark glossy green leaves which turn yellow-orange and scarlet in the autumn. Obovate to oval pointed leaves. 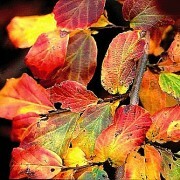 Parrotia persica is a small to medium wide spreading tree with deep green leaves which turn to crimson and gold in late autumn. Crimson tiny flower clusters in late winter. A piebald textured trunk. A member of the Witch Hazel family. 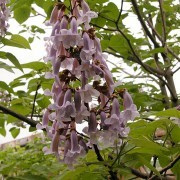 Paulownia tomentosa is a medium tree. It has spectacular large downy flowers beneath green leaves. Heliotrope-blue flowers shaped like a foxglove.